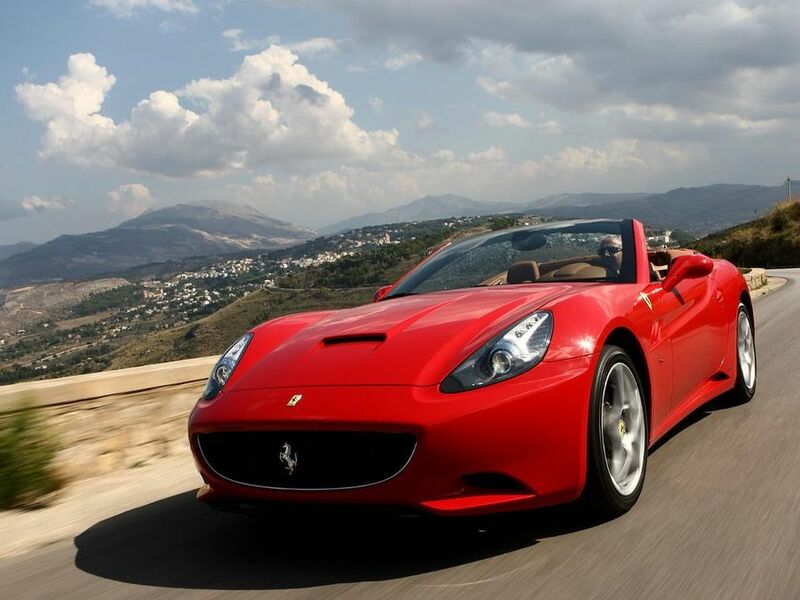 Read the Ferrari California convertible (2008 - ) car review by Auto Trader's motoring experts, covering price, specification, running costs, practicality, safety and how it drives. A Ferrari for all seasons and all reasons? That’s certainly how it seems with the new California convertible. Interested in buying a Ferrari California? The Ferrari California has the classic proportions of a front-engined, rear-wheel-drive sports car. It looks good, roof up or down, although some details like the door handle design are a little fussy. Twenty years ago Ferraris could be quite spartan inside. Not anymore. The California may be supercar-quick, but with its plush, leather swathed, air-conditioned interior and electrically adjustable seats, it’s also happy to play the luxury convertible. The driving position is excellent. Ferrari gives customers the choice of two small rear seats or extra luggage space behind the front seats. Choose the 2+2 layout and there’s very little space for anyone to squeeze in. With the folding metal roof raised there’s a healthy 340 litres for luggage, but if you want to enjoy the sun you’ll need to travel light. Once folded the roof eats up 100 litres of boot space. The front engine, rear gearbox layout makes the California more evenly balanced and less nervous handling than the racing-layout, mid-engined F430 models. The California doesn’t bite as instantly into a bend as an F430 and it is a much heavier car. In true Grand Prix racing-inspired manner twisting a switch on the steering wheel adjusts the car’s handling. So-called comfort mode, still quite firm, is for all conditions, while in sport you can kick out the back end of the car to a surprising angle before the electronics take control and brake individual wheels to bring it back in line. Most people will hear the California before they see it thanks to the amazing sound of the 4.3-litre V8 engine. Send the rev counter needle heading towards 8,000rpm, pull back on the steering column mounted gearchange paddles and start heading through the seven gears and the California is massively fast. In other words it is a proper Ferrari. Of course, the Ferrari is an expensive car to buy and run, but compared with some exotic machines the official combined fuel economy figure of 21.6mpg is quite reasonable. Carbon dioxide emissions of 299g/km are lower than many supercars’. The long waiting list suggests the California should hold its value well, too. Build quality is excellent and the California should prove reliable. Ferraris are usually less fragile than reputation suggests so long as the cars are used regularly enough. The traction control and stability systems can be tuned to suit the road conditions or the driver’s mood. Airbags aplenty should protect driver and passenger should the worst happen. Touch-screen sat-nav, electrically adjustable leather seats, tyre-pressure monitoring and a satellite tracking system are all included in the price. Although the standard kit list is comprehensive, buyers can still personalise their cars to suite their taste. The Ferrari California is the real deal. Despite its bling looks and convertible abilities it’s not just a poseur’s car.